Lloyds Metals and Energy Limited fully accepts its responsibility for providing a safe working environment and is totally committed to promoting and maintaining the highest standards of health, safety and environmental (HSE) management within all Company activities during process and manufacturing of sponge iron ore. Incident prevention shall be addressed as a core business value within the total company environment. We have obtained the Certificates of ISO - 9001, 14001, OHSAS 18001 and now we Shall Upgrade the Standard to 2015 Version in next month 2018. About Developed to provide the guiding principles and for the HSE system. It is supported by the LMEL HSE Operational Procedures, which provides greater detail on the elements contained within the HSE Management. Whereas the HSE Management. l should remain relatively stable and not require frequent changes, the HSE Operational Procedures Manual will develop and change in response to the growth and change within LMEL. LMEL first Trarget is maintained "Zero Accident" and Provide the Safe and Healthy Environment to Workmen. We have achieved the Zero Accident Target in Year 2014 - 2015. Now we have try for the achieve Target with Safe and Healthy Environment to the Workmen. 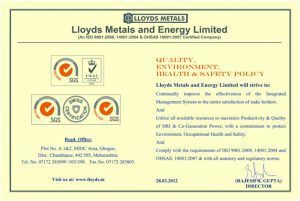 Lloyds Metals & Energy Limited (“LMEL”) fully accepts its responsibility for providing a safe Working environment and is totally committed to promoting and maintaining the standards of health, safety and environmental management within all Company activities. To realize this vision, all LMEL operations and employees shall work together to protect the quality of the environment and the health and safety of our employees, stakeholders, and neighbors. LMEL has in place a Health, Safety and Environmental management system for all our activities that drives continual improvement. Lloyds have developed the Policy for maintain the HSE Standard, for Example : Mobile Devices on Worksites, Substance Abuse Control, Personnel Protective Equipments Policy, Safety Disciplinary Policy etc. Any worker suspected of being impaired will not be allowed to continue working. The site supervisor will discuss the situation with the worker safety representative and site foreman if a sub-contractors’ worker is involved. If the employee is deemed unfit for work, the employee will be taken home. Instill a sense of environmental awareness and responsibility amongst our people; protect the natural and cultural environment in all our operations in a socially responsible manner; embrace the principles of waste minimization and pollution prevention; continuously improve our environmental performance by setting objectives and targets, assessing our achievements and evaluating the effectiveness of our environmental management system.